Export path - defines the path where the exported file will be saved. Either it is pre-set or it is possible to change it. You can select among local memory, Dropbox or Google Drive (both apps must be installed first). GPX - GPS eXchange format is an XML based text format used for handling points, tracks and routes. Locus fully supports all valid tags. More detailed description of GPX format is available on this Wikipedia page. KML/KMZ - Keyhole Markup Language is XML based plain text format with really wide range of usage. Since the version 2.2 KML format is standardized by OGC so it is used by many web/desktop/mobile applications as well as Locus Map. It is usable for export of both points and tracks. Include icons and attachments - enables packing data into one KMZ file - icons, photos etc. CSV - (Comma Separated Values) is a common, universal and relatively simple file format that is widely supported by many applications. Usable for export of both points and tracks. Parameters are just Export visible and Share. OV2 - TomTom format for POI database. The same parameters as CSV. Allows overwriting already exported data files (points or tracks). 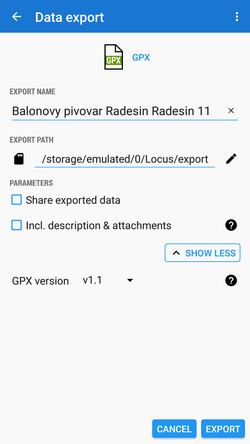 When exporting multiple geocaches to a GPX file all of them are checked if they contain complete information (listing etc.). If they contain just basic info about coords, terrain, difficulty, they are automatically updated - export of geocaches takes a bit more time than in case of ordinary points.